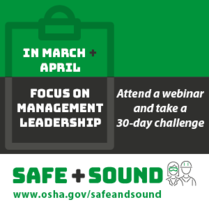 Our focus on Management Leadership is starting with a webinar this week. We hope you will join us and help promote it with your membership. Information on next month’s challenge will be available soon – please keep an eye out for that. As always, we welcome your questions, comments, and suggestions! Mr. Campbell will tell the story of how he came to embrace safety and health in the workplace, as well as highlight the specific actions he has taken and the results he has seen in his organization. He will also provide ideas any business – regardless of size or industry – can use to get started on building its safety and health program. Recap on what to expect in 2019 – Get ready! Join us for quarterly events on building an effective safety and health program in your workplace. Learn about best practices during our webinars and put them into action during our 30-day challenges. We’ll focus on management leadership, worker participation, and finding and fixing hazards. 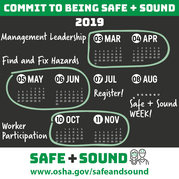 Share your safety successes during Safe + Sound Week, August 12-18, 2019. 2018 was a great year! We have almost 50,000 participants and last year’s Safe + Sound Week events reached 1.7 million workers! Check out our infographic to see more about how much we have accomplished together to be safe and sound at work. Keep an eye out for next month’s challenge on Management Leadership! Take another look at the 2019 Preview so you can plan your communications activities! Battery Council International hit the ground running after signing on to partner with Safe + Sound in July, 2018. They followed up a news release announcing their partnership with a three part blog series for Safe + Sound Week. Through these posts, they brought awareness to industry hazards, highlighted solutions to those hazards, and featured the activities of participating members. Learn more about what they have done here. Thanks, Battery Council International! Send us your ideas, comments and suggestions!